We're celebrating pure Welsh holiday gold, in the form of historic treasures, castles, moats and the glorious natural landscape this month. 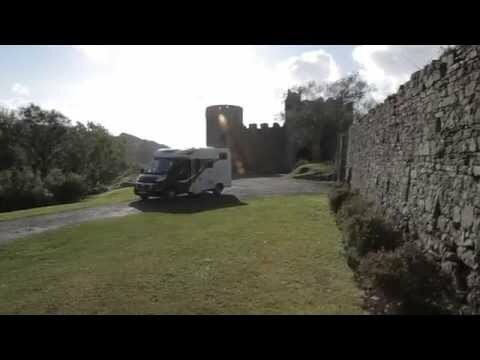 First, join us for a grand tour of South Wales, as Claudia Dowell heads off in a Bailey Approach Compact 520 to seek out the castles and poets of this beautiful country. She also meets the only giraffes in Wales, while colleague Bryony Symes feeds the lions at Folly Farm. We love to feature your tours, too, and Cardiff is the destination for reader Maureen Johnstone as she and her husband take a long weekend in one of the UK’s most vibrant cities. Our popular sites and sightseeing feature also shines the spotlight on both North Wales and South Wales in the January issue. Don’t miss our comprehensive guide to what to see in this beautiful country, along with our selection of 10 top campsites that offer a warm welcome to you and your motorhome. Film glamour and fun as our Bond trail continues! If you enjoyed last month's James Bond film locations, don't miss this issue as we continue our adventures, following in the tyre tracks of secret agent 007. In the second part of his feature, John Capel reveals more UK locations that formed the backdrop for some thrills, spills and explosive plot lines in the world-famous Bond movies. This issue is on sale in the shops from 19 November, so it's the ideal time for some Christmas shopping. Read our new festive shopping guide and get your friends and family some fabulous gifts at one of the top Christmas markets around the UK and Europe! If the very thought of going out Christmas shopping fills you with dread, why not go online and bag a bargain gift subscription to Practical Motorhome? We also have a fun-filled Christmas gift guide in this edition, to help you find the perfect present for the motorcaravanner in your life. In this month's competitions we're giving you a chance to win tickets to Manchester's Caravan and Motorhome Show in January. We have 10 pairs of tickets to give away, so click here to enter online. While you're on a roll, enter our prize draw for a chance to win the amazing MudBuster Caravan & Motorhome Exterior and Interior Cleaner, which we reviewed here. Is your motorhome a palace on wheels, or the kind of 'van you can use for your daily commute when you're not on holiday? We take a look at a used Volkswagen Transporter, transformed by an all-new conversion into a bespoke beauty named the Coast 2 Coast Blenheim. Why buy a car, when you could get a motorhome that's versatile enough to use daily? With its distinctive red nose panel, the 2016 Hymer Van 314 could take you everywhere and certainly stands out from the crowd. Editor Niall Hampton passes verdict on this compact garage-bed coachbuilt. We also review the 2016 Roller Team Zefiro 696. This Italian brand is renowned for offering stylish motorhomes with small price tags. Find out how the 2016 island-bed 696 fare under our expert's scrutiny in the January issue. If you're looking for new and used motorhomes for sale, don't forget that our new classified adverts are now live online. You may even spot one of the 'vans featured in this month's used ’van challenge. We compare a trio of campervans from Wellhouse Leisure - three campervans, three budgets and it all adds up to one adventurous and fun lifestyle. Our used ’van buyer's guide this month gives you our expert's lowdown on finding a great CI Granduca Pegaso for sale. We report on what to look for, known trouble spots to avoid and how much to pay for this used motorhome. We round-up our pick of the highlights of the Motorhome & Caravan Show at the NEC. Featuring coachbuilts, campers, van conversions, clever designs and A-class motorhomes. With winter weather sweeping in, our motorhomes are getting muddy! So this month we've tested and compared an array of popular motorhome cleaning products. Buy the best and keep your ’van spick and span with one of these top cleaners. We also have a new inflatable awning test for you, as Kampa’s Motor Rally AIR Pro 260 L comes under our scrutiny. We've reviewed plenty of inflatable awnings this year, and you can compare the Kampa awning to its rivals here. Motorhome workshop guru Diamond Dave gives his expert advice on how to prepare your ’van for the winter. We have security on our minds this month, too. So don't miss our DIY workshop, because this time we take an in-depth look at an alarm system made specifically for leisure vehicles. If you've decided to lay up your 'van for the winter, get it ready for the coldest months with our hints and tips. The last word goes to our readers Sharon and Chris Smith. In our 'tour that changed my life' series, they reveal how they hit the road and went full-timing in their Bessacarr after selling their home.